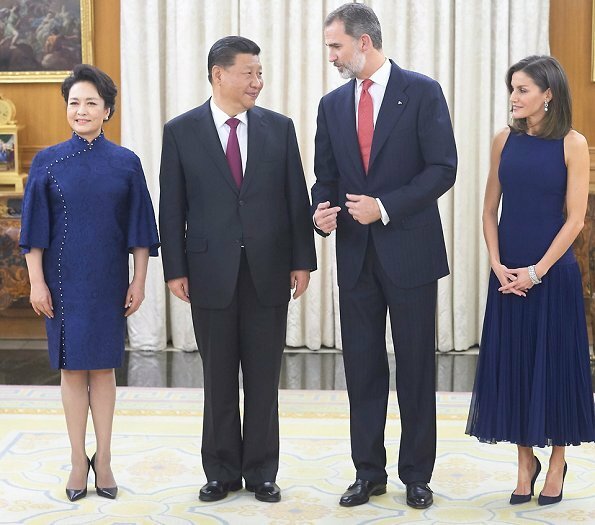 In the evening of November 27, 2018, King Felipe VI and Queen Letizia of Spain received Chinese President Xi Jinping and wife Peng Liyuan for an official dinner at the Zarzuela Palace in Madrid, Spain. China's President Xi Jinping and his wife Peng Liyuan arrived in Spain on Tuesday for a three day official visit. Wow what a stunning dress this is. Letizia looks like a million Dollar. What a nice color. Mrs XI looks great too. Madrid has the typical seasonal temperature of about 13 degrees Celsius, that being said it's rather irrelevant since the reception happens indoors, and the queen is wearing a cocktail dress which believe it or not they do come with or without sleeves, have you not seen pictures of every European royal sporting dresses like these on semi formal dinners? SMH!! 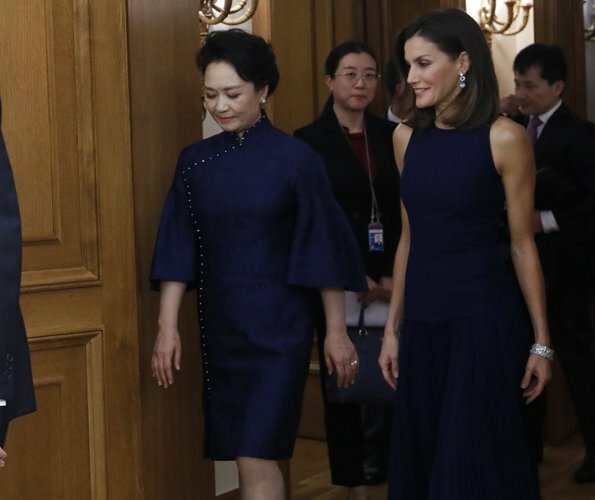 Love Letizia's dress, fluid, feminine and chic, I also find Mrs. XI rather elegant, winner looks for both ladies. Not at all. Today,28th november we have very low temperatures: 0°centigrade at 09:00 a.m. Into a palace there is heating. In Sweden do they wear a coat, scarf and hat indoors?? Cooling temperatures yes. Dinner on the patio or a backyard barbeque, no. Anon 12:35 You made me laugh! Also so funny how stuck people get on their ideas of what these ladies should be wearing. It is not the 50s anymore. Both ladies in navy. While the dresses are very different, I like them both. Each dress looks very nice. 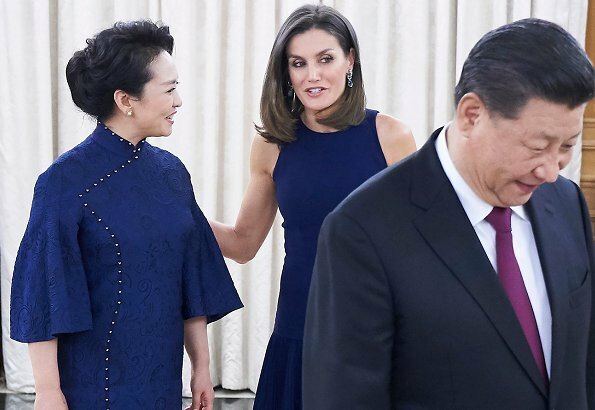 I like the Chinese President's wife's dress very much. The flared sleeves and the studded design are quietly stylish and elegant. Hair, make-up, dress, everything on point. The dress hugs and flows in all the right places. It certainly does not hurt to be in shape. Picture #5 shows her at her best, and those green eyes.... For those who complain about bare arms, see the pictures of Q. Ena taken when she was an older lady. Great looks on both ladies. Queen Letizia looks smashing, absolutely fabulous. Wonderful and twirly dress, amazing jewellery. And the king is very well dressed, almost Prince Philip level well dressed. Wonderful looks for both ladies - I love both dresses. Here we can see two very different styles and both looks great. It's a good reminder, that there is not only one proper style for all. I think it's nice, we have so many different styles among royal ladies: Maxima, Letizia, Victoria, Mary, Kate, Meghan, Charlene, Caroline, Mette-Marit etc. And they all look good in they own way. And then we have the seniors: QE, Silvia, Margrehte, Camilla, Sonia and so on with their styles, which are ok as well, just not the good examples for the younger ones. There is no such thing that could be called royal style. Let them be royals in their own personal style. The Chinese president's wife is beyond beautiful, I love her dress too. Spanish queen is her usual self...beautiful dress and earrings to die for! Both ladies look very good, both with very diferente styles but both impeccable. Letizia once again with a NEW look but with an "used" dress, and as almost always it appears new and perfect. Mrs Peng has an amazing posture, beautiful! Ein sehr, sehr schönes Kleid trägt Letizia hier, aber auch finde, dass sie das im Frühling/Sommer tragen sollte. Die Präsidenten-Gattin kann es besser. Sie trägt ein passendes, wunderschönes Kleid für diesen Anlass. ...Etwas zu kurz fuer meinen Geschmack, laenger waere eleganter. Das Kleid der Koenigin sitzt wie angegossen. Makellos! De ópera china, no de ópera occidental, no es lo mismo. Canta folklore chino. Gorgeous dress, beautiful and striking colour and perfect fit for her figure. Amazing!! Letizia is stunning. From head (hair) to toe. Bravo! Es curioso que ambas damas hayan escogido el color azul de China. Es precioso. Adoro ese vestido de Varela, su gracia y movimiento. La pulsera gemela y las aguamarinas Bvlgari son para morirse. La Sra Peng viste un clásico vestido chino actualizado. Me gusta todo, excepto las mangas. Vaya altura de tacones que lleva, hehe.